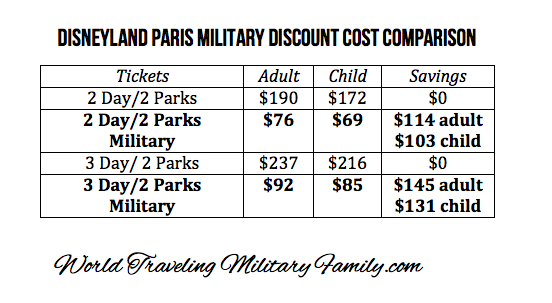 Yes, a Disneyland Paris military discount does exist! I’ve seen this asked a lot recently. They don’t offer a discount on the hotels or packages like in the United States but they do offer a discount on the park tickets to include Disney Studios right next to Disneyland Paris. We saved $442 using the military discount for our family of 4! I’ve already posted about our Walt Disney Studio Park experience and will be posting about our time at Disneyland Paris soon! The military discount requires you to go to the ticket office and show your military ID. The rates for 2015 were 2 Parks for 2 Days is €69.50/$76 per person for ages 12+ and €63/$69 for ages 3-11, this is a huge discount compared to the normal prices. The normal price for 2 parks/2 Days it is €173/$190 Adult and €157/$172 for kids ages 3 to 11, ages 12+ are adults. We are talking a difference of $114 per adult and $103 per child for 2 days! You can also get a 3 Day/2 Parks for €84/$92 adult and €78/$85 child. Compared to the normal price of €217/$237 adult and €198/$216 child. Savings difference of $145 per adult and $131 per child for 3 days! The price is valid for the military member and up to 4 accompanying family members. This deal was started in Feb of 2014, we used it in Oct 2015, it should continue for 2016 as well but prices may change slightly so check the website or call to verify. While the Disney hotels don’t offer a military discount you don’t need to stay in one to have a great experience and there are some great hotels that are not Disney report ones, that are budget friendly and provide perks like free shuttle service and free parking at Disney. You can read about our experience at Explorer’s Hotel, which I recommend if your headed that way. 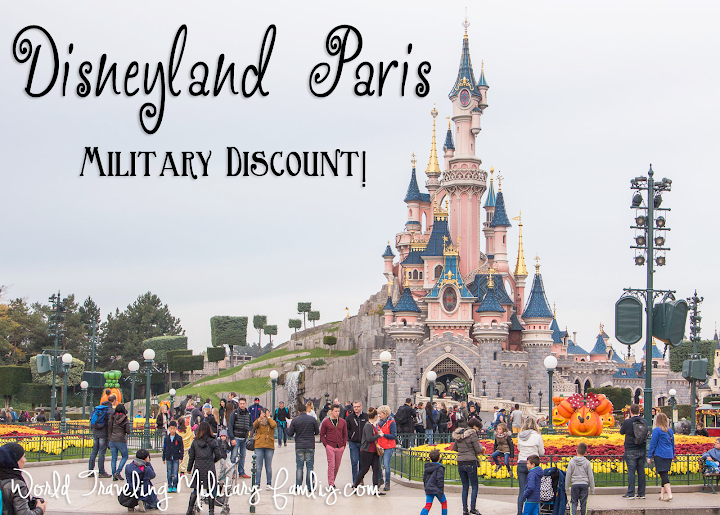 Have you used the Military Discount at Disneyland Paris? Any tips or tricks to share? I’ve seen many spouses say that they’ve gone without their AD member and had no issues. Unfortunately there is on way to purchase the tickets in advance, only at the ticket office to the parks upon arrival. Do you know if this offer still exists as I am planning a trip to disney this weekend? As far as I know it is. Were you able to get your discount? I’m looking at going in March and we can’t find definitive info on it. I called Disney Paris this evening and the gentleman told me that this was still effective (for up to 4 people) until May 2017!!!! Can any countries military get the discount? Not sure, you’d have to call Disneyland Paris and ask. Does the discount apply only to active duty? Or is the offer extended to CIV/Contractors with a valid CAC? I am not sure, I have heard that some Civilians with CAC cards were able to get the discount on a page I’m on but I’m not sure the official policy on it, I’d recommend calling Disneyland Paris and asking for clarification. Is there a deal for 1 day passes? No, the smallest deal you can get is the 2 days 2 parks deal with the discount. What about 2 adults and 3 kids? Well one is 13 so considered an adult I believe right? You can get a total of 5 tickets, one for the AD member and then up to 4 more for family members. Kids 12 and over pay the adult rate. Explorer Hotel is a little expensive for my family of 6, is there any other cheaper option with military discount? Hi, is that possible to buy tickets for one day & one Park only? Not with the the military discount, those are only for the 2 & 3 days. You can buy non discounted tickets for 1 day and 1 park from the Disney website or at the ticket booth at the park. Can military retired also use this discount? I am not sure of the official policy but I did go look in a group I’m on a someone posted that they were able to get the rates with a retired ID card in May. Hope that helps. Hi. I was wondering about transportation to the Explorers Hotel from the airport? I have a whole post on the Explorer’s hotel (search bar on the right) but the quick answer is that there is a free shuttle to and from the hotel to the Disney area. We used it and were happy with it. Does anyone know if the Royal Navy is included in the discount or is it just Army? I know it’s good for all US Military (Air Force, Army, etc) not sure about services from other countries. Planning a trip to Disney Land Paris for April 2017. It will be during the 25 anniversary celebration. We are a family of 6. we are a Military family. Since it will be a busy time of the year, is there a possibility of Disneyland running out of tickets? Hi there! I can’t say I’ve ever heard anyone say that they could’t get tickets because they’ve ran out, but I don’t have any official info regarding that. Hope your trip goes well! Hi there, Thanks for derailed chart for easy reference! As I read, 4 tickets for military card holder and spouse can also get ticket without AD member. It’s possible to ger 4 ticket by active duty and 2 mote tilet by spouse? Our family is size of 6 and youngest is 3 years old… do they need ticket for 3 year old too? Thanks in advance ! While I haven’t personally done it I have heard of families who have done that. The AD person gets X amount of tickets and the spouse in another line gets X amount of tickets to get the up to 4 tickets per ID card holder. Does anyone know if this offer is still valid? Also, is it only for US military personnel (I’m UK military)? Yes, offer is still valid. You’d have to call and see if it applies to UK troops. I know it’s good for US troops as well at French troops. Does anyone know if this offer is still valid in 2018? Traveling from US in March and trying to use all my resources before I make the international call to Disneyland Paris. Thank you in advance. I called today from the U.K. on a number I obtained from emailing Disneyland`Paris and was told that the Military discount is still being offered, tickets can only be purchased at the gate using a Serving or retired military ID card.